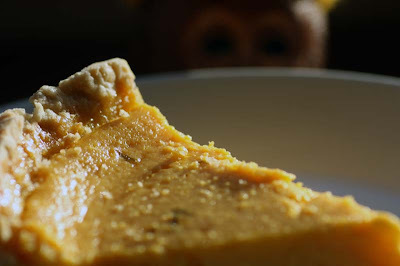 You may be interested to note that since starting this blog, I had never posted a recipe that echoes my pseudonym ‘mango cheeks’. Not for lack of wanting, when in season I’ve eaten a number of fresh and ripe mangoes straight from its smooth skin. Softening the fruit with my fingertips and then supping up the sweet puree from its golden yellow and red tinged skin. It is for this reason I’ve not used any mangoes for cooking - it is simply delicious fresh. Well, finally here is a mango recipe. It is a Crème Mango Lime tart. Sadly it is not made with fresh mango as those I love are not in season yet. This mango recipe is made with tinned mango puree. The tinned mango puree has been sitting in my store cupboard for a little while waiting patiently for its turn to be transformed into something quite yummy; and it did not disappoint. This mango tart filling was sweet, soft and sublime, but there is a 'but'. The pastry base did not work well with the filling, for some reason it did not compliment the mango custardy filling. When the mango tart came out the oven it was all puffed up. It reminded me more of a cheesecake, than a crème or creme brûlée. I know the pastry in the above image looks a bit messy, but please note I had yet to trim off the excess pastry. Put the sugar, eggs and cream in a bowl and beat with an electric beater. Stir in the mango puree, lime juice and zest. 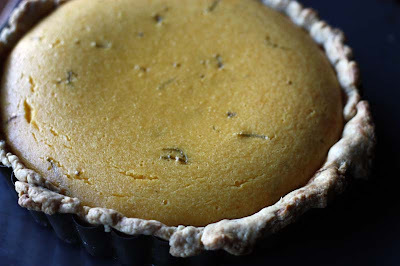 Pour into the pastry case and bake for 30 – 40 minutes or until the tart is just starting to set. Remove from the oven and let cool. Optional: To take this recipe a step further, you can make this Crème Mango to a Mango Crème Brûlée tart. For this you will need to sprinkle 2 tablespoons of brown sugar over the top and put under a preheated grill or use a cook’s blowtorch to melt the sugar until it is molten and bubbling. Adapted from Jane Noraika New Vegetarian Entertaining. I love lime tart. And now you've just added one of my favorite fruits in it! Must be absolutely delicious! Hey, I just rediscovered your blog again, its amazing. Thank you for sharing wonderful recipes! I love fresh mango too but tinned mango would be perfect for this. Maybe it could be made with a biscuit base like a cheesecake. 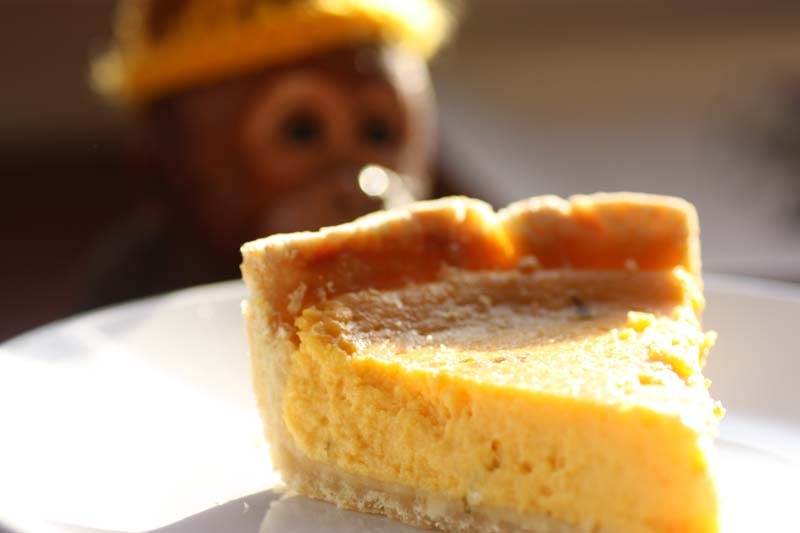 Oh my, your mango tart looks WONDERFUL! A friend and I recently tried a mango tart from the bakery and were very disappointed - yours looks much, much better! :-) I'm so excited to be able to fix your recipe and enjoy a proper mango tart - thank you!! yum yum - will have to try this when our mangoes are a'plenty. Sadly this season is over for us, and because we had a lot of rain when they were in flower, there were barely any mangoes. I will keep this recipe in mind though - looks just scrummy. Ooooo, that looks so lusciously rich and creamy, yum! My mom's best cheesecake growing up had a shortcrust, I'll have to dig out that recipe. Thanks for stopping by my site. ☺ Oh, and now I have "cockles, and mussels, alive, alive oh..." going through my head... :D That's okay, I like that song. Sorry to hear that the pastry wasn't a success. It definitely wouldn't stop me from having a slice though! 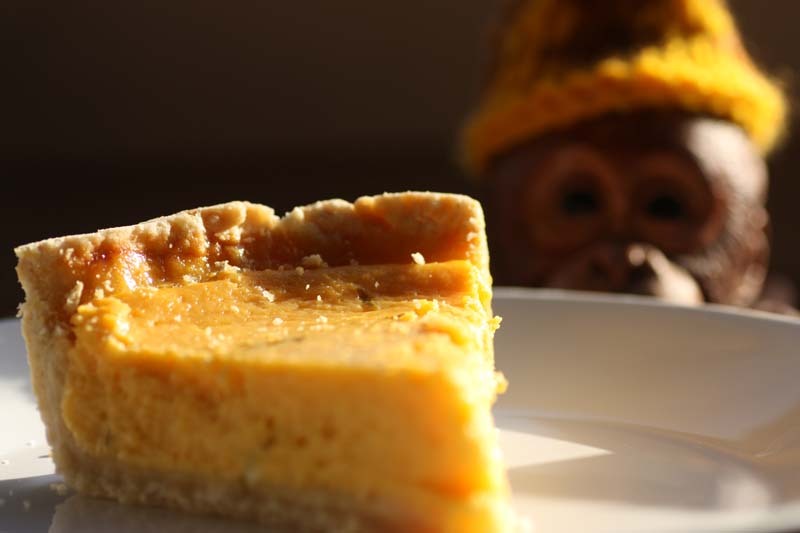 Love the cheeky monkey in the background of your pics! Sounds lovely. I wonder if puff pastry would make a nice crust - light and pretty flavorless ... although, it's buttery. Hm. This sounds really good and I am just dying to get out of my current fruit rut. Or lack of fruit rut. when I am lucky enough to get a good mango I also like to eat it as it is: the perfect fruit and dessert! But I found some quite nice Indian mango puree, and that I can use to make desserts!! I just noticed you were in Leigh-on-Sea, I had a trip out there a couple of weeks ago, I did a post about where abouts are your family ? It was, bar the pastry. To answer you question, you may be surprised to note that 'mangocheeks' has absolutely nothing to do with me. Truth is I tried to put my real name first, and then a nickname of mine as my blogger name, but for some reason blogger or was it google would not permit me to have it. Thank you so much PurestGreen. So lovely to make your acquaintance. I agree with you and think a biscuit base woudl work well. Thanks Astra Libris, for such a lovely comment/compliment. Are you telling me you have your own mangoes growing?! Wowee - Lucky, lucky you. MY mother would love your place. I do hope some mangoes comes though for you later and the rain hasn't destroyed them all. Thank you so much for repaying the compliment and coming by my blog. It is appreciated. Recipes are like that - hit or miss - the fillign was luscious though. Thanks for commenting on my adopted Orangutan. My husband was wondering if anyone had commented on him! Now go and get yourself a juicy clementine or a crispy apple. I do think eating a mango fresh is the best way. You right to say its the perfect fruit and dessert! Ah I just checked out your blog and noted that you went into that craft shop in the alley. It was closed when I walked by it :( We were there around 9am. My mother in law has just recently moved to Pitsea, hence the reason for our visit. I love the name 'Mangocheeks'! I also love mangoes and this does look wonderful, not had anything like it before. I'll be making a few more mango inspired recipes soon, as I have some puree left over - so do come back. Looks beautiful. Perfect after a meal - sweet but zingy! The thought of revealing my real name (which is also rather unique) has been on my mind a lot recently, and it is something I am seriously thinking about. So who knows, before the year is out my blogger name will change. I discovered your blog two days ago and i can tell you that i love it. Your recipes are great !!! Have a nice day! Thank you so much Anca. A divine yellow bright mango & cream tarte!